Kobe Bryant's 19th season with the Los Angeles Lakers is likely over after recently tearing a rotator cuff, leaving doubt that the 36-year-old will be able to resuscitate his legendary NBA career. That career was very much alive more than a decade ago, when he was already a three-time champion. Bryant has never known anything other than Lakers purple and gold, but he apparently came close to trading those iconic colors for the Wizards' humdrum blue, black and bronze. 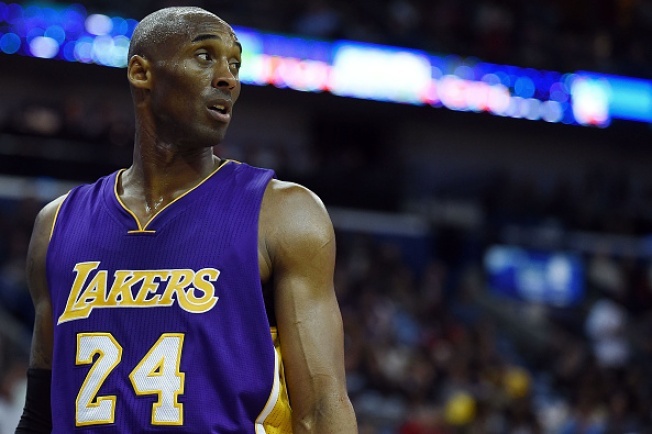 Bryant wanted to get away from Los Angeles, and the team he wanted to join was the Wizards, where he would join forces with his mentor Michael Jordan. Those plans evaporated when then-Wizards owner Abe Pollin parted ways with Jordan in 2003, a year before Bryant became a free agent, but as Wizards fans pine over the idea of Kevin Durant coming to Washington as a free agent, the near-miss that was Kobe-to-DC finally can be shared. According to Lee, "the Wizards never had the assets to discuss a trade for Bryant, so the only chance the organization would have had to make a run at him was when he became an unrestricted free agent in 2004." "Jordan, however, wasn’t allowed to recruit Bryant because Pollin decided in May 2003, not to let him continue running the team," Lee wrote. "While Jordan’s ability to land Bryant was no guarantee, a person close to him said Jordan was 'confident' he would have made it happen." Plop Bryant onto this roster. Championship caliber? Far from it. More exciting? No doubt.